Authorities at the Guyana Prison Service were Wednesday night probing the stabbing of a prison officer allegedly by a 73-year old man accused of murder. Prison authorities were also trying to find out who is behind the smuggling of phones, SIM cards and drugs into the brick prison of the Georgetown Prison, the lone building that remains standing in the aftermath of last month’s fire there. He attempted to break it up and was stabbed to the left arm by the elderly murder accused. He was rushed to the New Amsterdam Hospital where he received seven ‘stitches’ and was sent away. Sources said the inmate was being moved from one section of the prison to another when he broke a PVC pipe and stabbed Lewis. 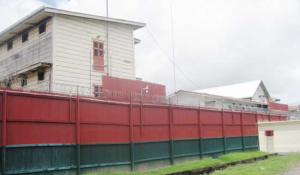 Meanwhile, Director of Prisons Gladwin Samuels said between 6:15 AM and 8:40 AM Wednesday, a joint operation was carried out at the Georgetown Prison where the entire brick prison was searched. Samuels said a small amount of marijuana, three cell phones along with three Digicel SIM cards, four lighters, 20 improvised weapons and three razor blades were found. The majority of the inmates at the brick prison are being held for very serious crimes including murder. Prior to their removal from the swampy holding area at Lusignan, they were checked thoroughly for prohibited items. The Prisons Director has repeatedly expressed concern about collusion between prison service personnel, prisoners and other persons in compromising the integrity of jails across the country.